Half the fun of Tintin's is finding it. It couldn't be in a more back back street, but now, since they signed up the Kodak shop next to Barakuda diving it's the place to be seen from 9pm. It is just 120 meters from the main pier off main street. Most places on the island follow the most popular in tunes from Europe without a thought to how they mix together. Tintin's gives you music on a theme all night....brings you up, takes you down... smoothes those rough edges away. Being a happy party island the beer is cool, the cocktails extravagant the wines drinkable (after the cocktails!!) Home of the divers bucket, large cocktails served in tin buckets with plenty of straws is a great way to start the evening. When it is too busy there are very few divers. When it's quieter and more cozy, beware the idle whale shark stories. After the Reef Bar (now Fatties) closed, it became Phi Phi Island's only dance scene and grew as the center of action. The nights were huge, the atmosphere frantic, definitely the biggest thing in Krabi province. 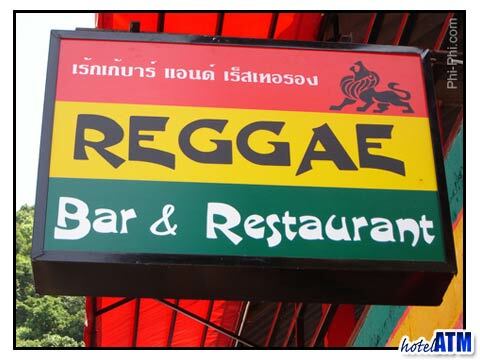 Since Reggae bar and others have opened, Tintin's has focused on the Music as a way of being distinctive.